Thanks to barnesandnoble.com for the image. 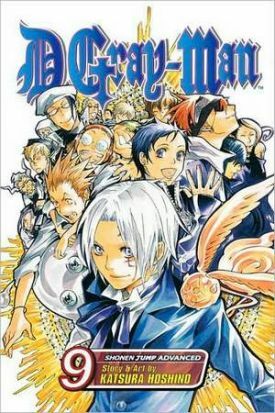 D.Gray-Man is set in a fictional version of 19th century England and focuses on a 15-year-old boy, Allen Walker, an “Exorcist.” His weapon: a substance with which he can bond called “Innocence” (in Allen’s case, the substance has bonded with his left arm to form a bladed weapon). His enemies: demons known as “Akuma.” Their leader: the Millennium Earl wants Allen. In D.Gray-man, Vol. 9, Allen’s comrades battle the Earl and his minions in Edo, Japan. Meanwhile, Allen, hiding in the secret lair of the Asian Branch of the Dark Order, nurses his injuries, while self-doubt plagues him. Soon, he will have to make a choice – become who he is meant to be or die at the hands of the Akuma that has been sent to kill him. THE LOWDOWN: A not untypical shounen manga (boys’ comics), D.Gray-Man is essentially a superhero comic, but whereas superhero comics tend to be fantasy or some kind of science fiction, D.Gray-Man is dark fantasy/horror. On the other hand, D.Gray-Man isn’t always dark; sometimes the action and fight scenes are wild with a humorous streak like something from Naruto. Visually, D.Gray-Man is Victorian and gothic, but the most visually striking thing about it is manga-ka Katsura Hoshino’s character creations. The narrative certainly lists at time, but Hoshino’s ingenious visuals and design work are worth even taking an occasional look at this title. POSSIBLE AUDIENCE: As part of VIZ Media’s “Shonen Jump Advanced” line, D.Gray-Man is aimed at high school age male readers, but the monsters and cool-looking villains will attract any young reader into shounen action comics.